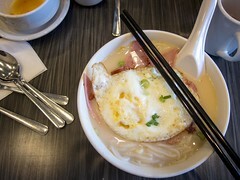 After my latest orthodontist appointment, The Hubby and I drove around Peach Tree Plaza in Markham looking for a bite to eat. 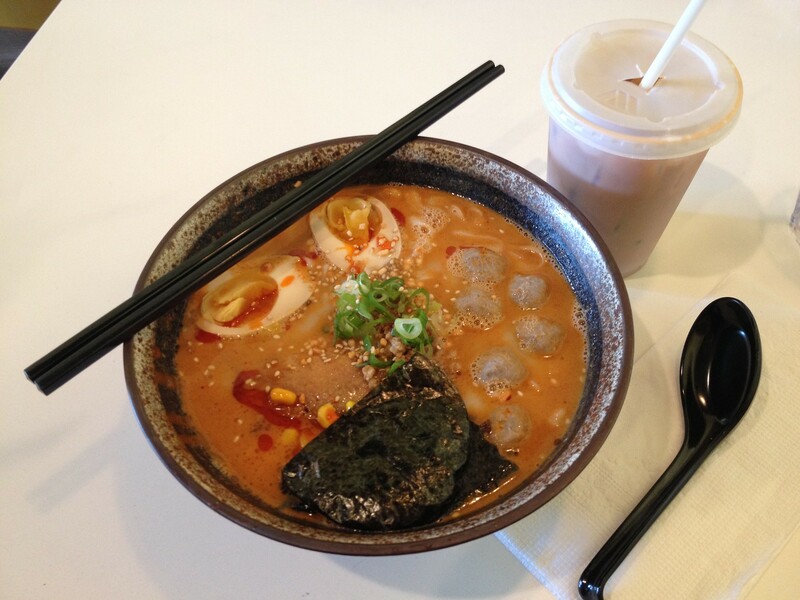 Chef Papa Tea and Noodle Bar, an unfamiliar, new restaurant caught our eye. 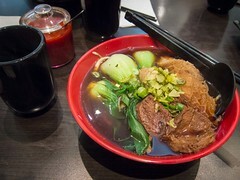 The fast casual restaurant offers customized noodle bowls across many Asian cuisines. Rice bowls were also available, like curry and Katsu Don. Atmosphere: Reminiscent of many casual Asian restaurants in Markham, Chef Papa was simple and relaxed. The hostess brought us to a clean white table and dropped off menus and order sheets. Our timing was great as a line began to form soon after we were seated. Most tables were filled with families and turned quickly. Service: Service was standard for the type of restaurant, not terrible, not amazing but efficient and adequate. 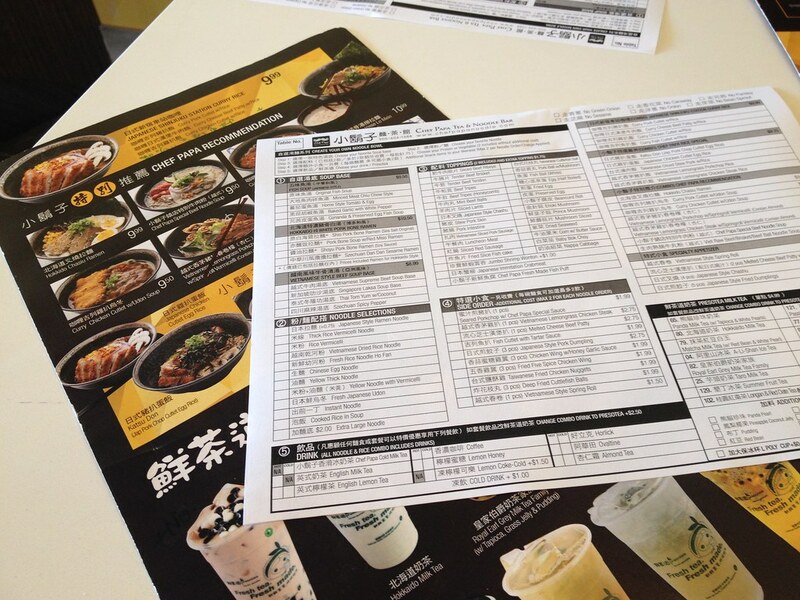 No one explained the menu to us and we flagged someone down once we figured out the ordering system. Our bowls of noodle arrived hot after a short wait. Our side orders took the longest, we were halfway through our noodles before they were dropped off. Cold HK milk tea was served in plastic cups. Food: At Chef Papa, there are two ways to order, off the menu or 100% customized. The danger of going the customized root, is of course picking ingredients that don’t go well together. 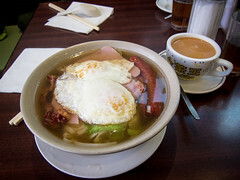 If you are worried, or not familiar with the soup bases, toppings and noodles, one of the preset menu items would be the best way to go. For us, The Hubby and I were all up for experimenting. With each noodle combo, two toppings were included and extra were charged at $0.50 each. The Hubby chose the Laksa soup base with egg noodles, topped with lamb slices and fish balls. His bowl also came with tofu puffs and a soft boiled egg, default toppings. For me, I went with the Szechuan Dan Dan sesame ramen with thick rice noodles, topped with beef balls and tripe (hidden in the picture). With mine, default toppings included corn, a soft boiled egg and nori. I did not know the bowls would have additional toppings. It would have been nice information to have when ordering, to help choose additional toppings that were complimentary. 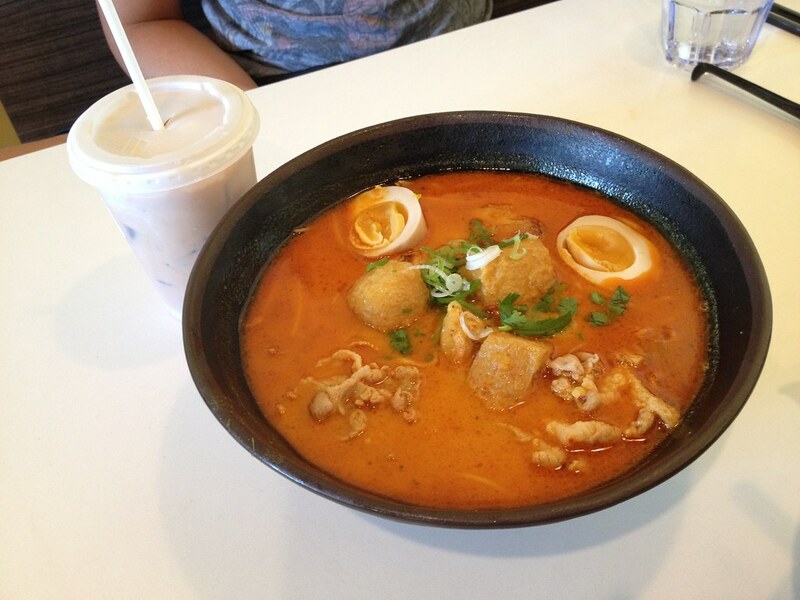 Between the two bowls, the Laksa broth won out. 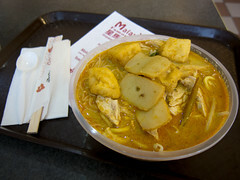 Both were thick and had strong, rich flavours but the Laksa had more depth, with a tinge of sweetness to the spice. The lamb slices added a mild gaminess as well. With my dan dan sesame broth, a touch more Szechuan pepper and chilli oil would’ve done the trick. My rice noodles were soft, not al dente but also not falling apart. Beef balls were generous as well. We also tried to combo add-ons, the Taiwanese popcorn chicken and a fried pork chop. The pork chop was barely battered and sprinkled with a few sesame seeds. I’m not sure what I was expecting, but this was a bit uneventful. At least the meat was tender seasoned. The Taiwanese popcorn chicken was a much better choice being crispy and juicy. Inside the restaurant was a Presotea stand with a selection of 16 bubble teas that could be ordered. The entire formula for the restaurant was identical to Deer Garden Signature restaurant. So far, with one visit each, I don’t have a favourite between the two. My allegiance may sway in the future, but so far I’d be happy with a bowl of noodles at either restaurant.